The Politics of Comfy: Do We Have to Suffer for Fashion? — AS RAKESTRAW - The personal site of Alex Rakestraw. AS RAKESTRAW | The personal site of Alex Rakestraw. The Politics of Comfy: Do We Have to Suffer for Fashion? As I sit down to write, my foot hurts. Not just hurts - stings. Bites. It reminds me that I dared to break in new leather boots on a day where I knew I’d run errands, walk to class, limp to office hours, and finally grit home before releasing my abraded toes from their Chromexcel cages. Hours later, my scrunched heels are still correcting the skin they so nearly lost. Even as I went through an arduous break-in recovery (Moleskine, Neosporin, a fresh pair of socks), I still found myself admiring the brown leather service boots that had caused me such discomfort. The French have an expression for this cocktail of pride and pain: “Il faut souffrir pour etre belle.” One must suffer to be beautiful. I may have suffered – but damnit, I looked great doing it. The irony of the situation didn’t truly sink in until the final step of my break-in recovery, coincidentally right before an afternoon jog. After a morning spent suffering in stiff calfskin, I slipped into stretchable, breathable, technical runners with a sole so cushy it’s “boost foam”. Thesis to antithesis in 5 minutes flat. And for what purpose? In a similar dichotomous framework as before, fashion to function. My bright blue dryfit and neon green running shoes announce to the world that I am here to go for a run and do not care about taste. For all the aesthetically-focused athleisure and techwear in the world, there is a decided utility in the garments – and utility, unless fetishized (looking at you, cropped military jackets) just isn’t fashion. Especially when it’s for something as transient as comfort. As my blistered feet ached well into the next day – a sensation anything but ephemeral - I thought more and more about the politics of comfort within fashion. What were the limiting factors against comfortable couture? Was there a good argument segregating comfort and style, or was simple elitism to blame? In my opinion, it’s both. Within the fashion world, there are politics of comfy. In the age of technical fabrics and computer-aided garment design, the argument that uncomfortable fabrics provide a certain aesthetic bonus that their plush comrades do not is quickly losing steam. Nearly any sheen can be coaxed out of any fabric a designer desires. Look no further than high fashion collections by Thom Browne, whose technical outerwear collaborations with Moncler through the Gamme Bleu line fuse haute couture and advanced modern weatherproofing. Gamme Bleu pieces maintain the wool-and-leather Thom Browne aesthetic, but incorporate utilitarian features like down insulation and nylon paneling. Other notable examples in this “utility and comfort made high fashion” context include Acronym, Y-3 by Yohji Yamamoto, Mackage, and Haider Ackermann. Each one of the five marques listed above produces a vastly different genre of clothing, but all share a focus on livable pret-a-porter – from velour sweatsuits to lightweight, sock-like running shoes. More importantly, each of the five stands on its own as a definitive fashion line, complete with Fashion Week runway shoes and urban center boutiques. Yet, all of the above share another common thread: they are all young. 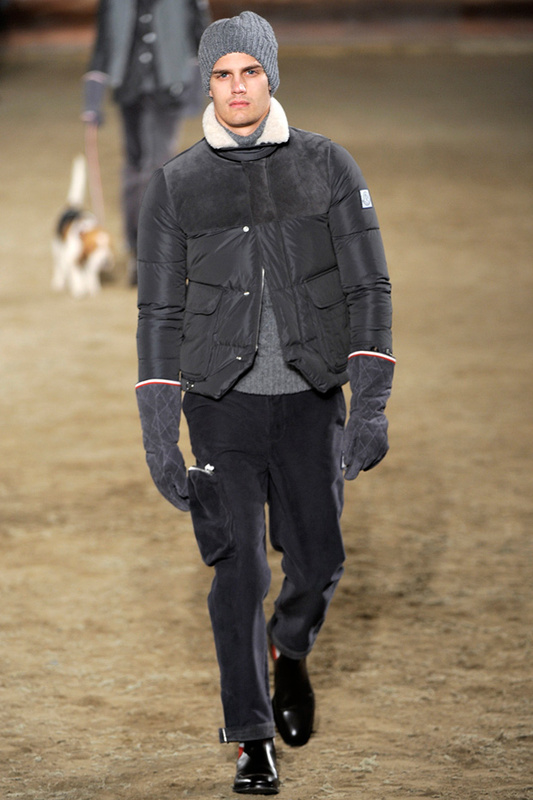 Even Moncler, the oldest of the bunch, was only founded (in its most recent, global luxury iteration) in 2003. In the eyes of fashion’s old guard, they are children - perhaps rebelling against their older, stodged parents. Whether is this is the seeds of change or mere trend is still up for debate. One thing is for certain: even as their contemporaries in affordable luxury (Michael Kors, Kate Spade, etc.) issue “french terry shorts”, “cotton pullovers”, and whatever words can be used to describe something other than a sweatsuit, Europe’s luxury houses rarely budge. The great Karl Lagerfeld issued what amounts to a papal bull against comfort for comfort’s sake: “Sweatpants are a sign of defeat. You lost control of your life, so you bought some sweatpants.” Coming from the creative director of both the fin-de-siecle Chanel (c. 1909) and interwar Fendi (c. 1925), it’s no surprise then that both brands overwhelmingly avoid synthetic fabrics or stretch-fit garments. As sales of affordable luxuries slump over concerns that their inherent, well, accessibility may have cheapened their appeal, the old ways (expensive; out of reach; uncomfortable) chug right along: LVMH - owners of Louis Vuitton, Dior, and more - is approaching a 5-year stock high, while Michael Kors stock is down nearly 50% over one year. Contrary to popular belief, it’s hard to inspire revolution if you’re bankrupt. The most sustainable approach, from both a business and heritage perspective, may very well be discomfort. It’s easy to write off her opinion as prep school snobbery, but there’s a deeper conversation within her words. In Friedlander’s view, “a boyfriend jean and a sweater” would provide an equal measure of comfort as an overarching concept – but the shred that’s lost to the nerve cells of the wearer is regained tenfold by showing the world at large that they care about their appearance. Internal feeling and external projection, both providing comfort in their own ways, but competing for shares of the same whole. Through this lens, there’s comfort in fashion. Every garment chosen is both a compromise and a value proposition: what does this piece provide me? How will it fulfill the role I need it to fill? Truly beautiful objects are designed with this framework of trade-offs in mind. My new leather boots – the heel-biting bastards that they are – are uncomfortable, yes; low-tech, certainly; but an objectively gorgeous display of Old World materials and craftsmanship nonetheless. On the other hand, while my Adidas are a triumph of well-skinned product design, they are stylized to facilitate their role as super comfy running shoes. Beauty is created by delicately balancing comfort and fashion. Only through acknowledging the political interdependence of the two, and not seeking their permutation, is greatness achieved.